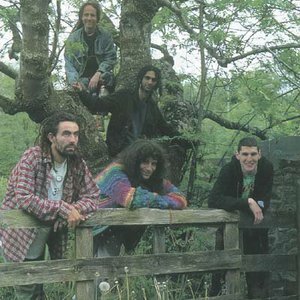 Ozric Tentacles (also known as The Ozrics) are an instrumental band from Somerset, England, UK, whose music can loosely be described as psychedelic rock. Formed in 1984, the band have released well over 20 albums as of 2005, and become a cottage industry selling around a million albums worldwide despite never having major label backing. The original line up met on June 21st, 1984, at the Stonehenge Free Festival and their name arose from discussions of hypothetical cereal brands (Malcolm Segments, Desmond Whisps, and Gordon Lumps are among the names that were considered). The original line up met on June 21st, 1984, at the Stonehenge Free Festival and their name arose from discussions of hypothetical cereal brands (Malcolm Segments, Desmond Whisps, and Gordon Lumps are among the names that were considered). In the 1980s the band built a fan base on the festival circuit, becoming particularly associated with the Glastonbury Festival, and made a series of cassette releases, sold at gigs and via a fan club. Their first label release was "Pungent Effulgent" in 1989, which was also re-released in the early 2000s, packaged with "Strangeitude". This was followed by "Erpland" (1990), an album dedicated to Erp, a character which appears on many of the band's album artworks. 1991 saw the "Strangeitude" LP. The track Sploosh! was used by BMW in an advertising campaign and became the band's only single. By 1993 the band had grossed over three million dollars, and their "Jurassic Shift" album reached the Top 10 of the UK Album Charts. The band have gone through myriad line-up changes, with only Ed Wynne (guitar, keyboards) and Champignon [John Egan] (flute) keeping a constant presence since the early 1990s. Many members left to pursue more electronic music spin offs acts, namely Eat Static, Nodens Ictus, Zubzub (Former Ozrics bassist Zia's new project) and Moksha. Nevertheless, the band maintained their identity and continued with this prolific rate of albums throughout the 1990s, and into the new millennium. They also continued to tour extensively, releasing a live DVD in 2002. The band are famous for their live performances, long fronted by Champignon, who danced around the stage in a trance-like manner and occasionally plays the flute. Ozric Tentacles have long taken an audio-visual approach to live performance, with an integrated lighting and projections crew. As of 2007, the line up features Ed Wynne (guitar, keyboards), Vinny Shillito (bass), Ed's wife Brandi Wynne (keyboards) and Merv Pepler (drums, percussion), Champignon having parted company with the band in 2005. After these first six cassette-only albums, the band began recording and releasing material on CD. These first six albums were released in 1994 as a CD box-set called Vitamin Enhanced. The box-set is now deleted, but the albums are available separately (with the above catalogue numbers).